Florida Georgia Line will debut the brand new music video for their current single “This Is How We Roll” featuring Luke Bryan on ABC’s Good Morning America tomorrow (3/7) in the 8:00A hour. Following the exclusive broadcast premiere, the first look online will be onGoodMorningAmerica.com on Yahoo and across all partners on 3/8. Filmed in the desert just outside of Los Angeles, the action-packed video features jaw-dropping tricks, tractor-trailers and fiery cameos with X Games champion Travis Pastrana and The Nitro Circus. 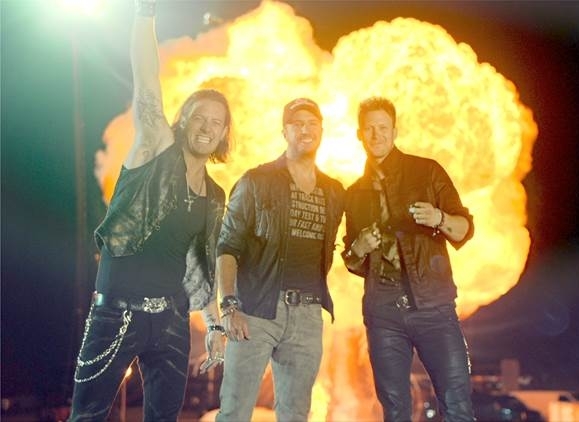 Director Marc Klasfeld amps up the thrills with cuts of FGL and Luke performing the catchy song, which is from the deluxe version of the award-winning duo’s chart-topping, platinum-certified debut album Here’s To The Good Times (Republic Nashville). The reigning ACM New Artist of the Year racked up four nominations – Vocal Duo of the Year, Album of the Year (Here’s To The Good Times), Single of the Year (“Cruise”) and Vocal Event of the Year (“Cruise” Remix featuring Nelly) – for the ACM Awards, airing April 6 at 8:00P Eastern on CBS. The unstoppable duo is currently on the road as direct support for Jason Aldean’s Night Train Tour.